Unless you're one of the lucky ones, you may not have to worry about cultivating those dormant seeds of faith in a loved one. Chances are, though, there's someone in your life who could use some cultivating. Maybe I'm Trying too Hard? As is becoming my routine, I read the Mass Readings during my Adoration Hour. When I read them on Thursday I highlighted different things than what caught my attention while listening to them during Mass. I think maybe I try too hard when I'm reading during Adoration and then what I really need to get from it comes to me during Mass. The first thing that I noticed when I read the Readings was the mention of birds being under a tree in the 1st Reading and then again in the Gospel. I'm enjoying spending my mornings this summer on my back porch listening to the birds waking up and getting down to business. I hear all different kinds of birds; with some, I can recognize their songs but some I can't. We have a section of our property just to the side of the house that we've allowed to grow...it provides a buffer between our house and our next-door neighbor's house and allows us a bit of privacy. The bushes started out small and have now grown to be quite tall, giving the birds nesting areas and plenty of places to hide. I like to think the birds all coming together are like the Catholic Church. It is universal; people from every nation come together for one purpose: to glorify God. We don't speak the same language but we are all united with the Mass as well as with the reason for participating in it. God has given us the large tree (the Church) that is massive enough for all of us. 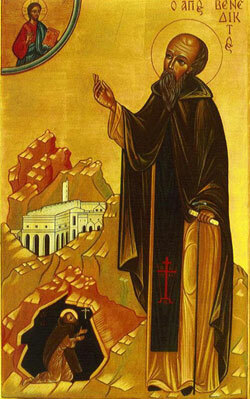 I have adult children who have strayed from the Catholic Church. My little chicks have wandered out from under that massive tree and the shade it provides. How do I get them back? 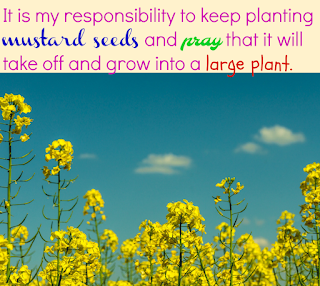 Today's Gospel (Mark 4:26-34) mentions a mustard seed that is sown and then grows to the largest of plants. 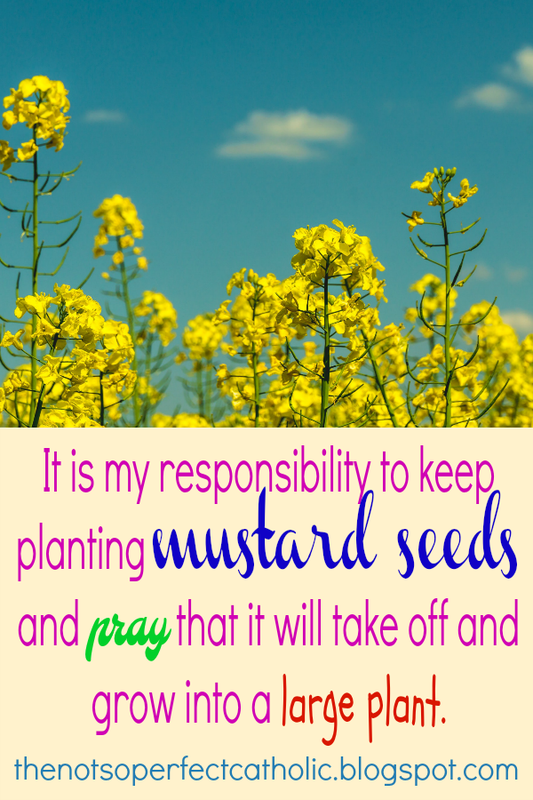 It is my responsibility to keep planting mustard seeds within them - little hints of Catholicism - and pray that it will take off into a large plant. If you have children of any age then you know that you can't come out and say something to them...they will do the opposite. If you come on too strongly they will run the other way. 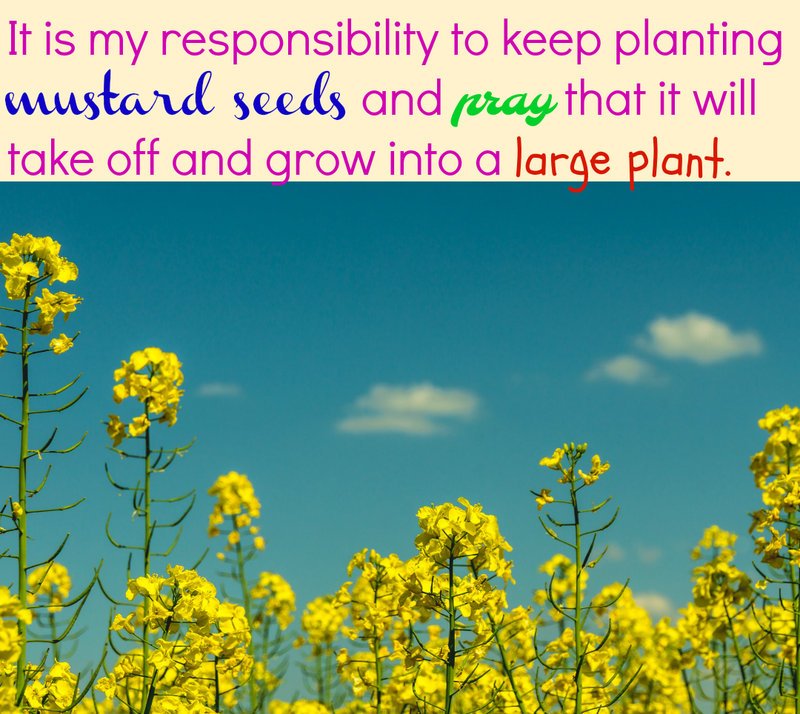 Planting those little seeds and then watering them by praying may just get that large plant. It's not going to happen overnight, but I have to believe that someday it will happen. How does that seed get planted? One way is by example. My "boys" see me praying; they see me reading books on the Catholic Faith. Another way is by leaving little things around the house: pamphlets or books. When I read Father Donald Calloway's book No Turning Back and read about his conversion, I thought about how ecstatic his mom must have been. Father's conversion was one of earthquake proportion. I realize that's probably not going to happen with my boys, but it definitely gave me hope. 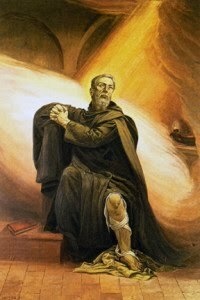 His conversion began with a book about Mary; I have plenty of those around the house! The other day something I said to one of my sons ended up sparking a discussion on Catholicism so you never know when something that has been said will take off into a direction you didn't expect. My boys are cradle Catholics so the seed was planted a long time ago. The problem is that they are lying dormant and need some water and sunshine to grow. Some Miracle Grow probably wouldn't hurt, either. Miracles do happen and I will continue to water those seeds as long as I live. 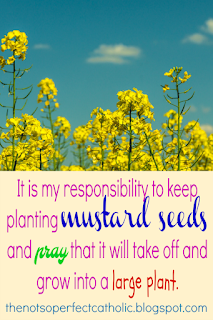 I will continue cultivating the dormant seeds of faith as long as it takes. Brandon Vogt has 7 ideas that may be helpful. He also has 3 definite "no-nos". Catholics Come Home is a website designed just for the younger ones who have fallen away from the Church. There is so much patience that’s involved when waiting for plants to grow. I’m a convert, so is my husband, but our children are cradle Catholics. One of our concerns is them walking away from the faith. They are always around some Catholic discussion, or an opinion that is seen through the eyes of our faith. I can only pray that their seeds take root and flourish. My advice: Make sure both you and your husband remain faithful to Catholicism. Actions speak louder than words. Sometimes I think if my husband (who is a convert) continued to attend Mass and be a practicing Catholic my boys would still be practicing as well.